Ice cream trucks, a familiar summer site in the U.S., have been around since the 1950s and have been very popular in the U.S. and the United Kingdom. Historically, the ice cream was kept cold with big blocks of dry ice. The motor was always turned off when a stop was made to sell the product. Often the chimes functioned by using a hand driven crank. An ice cream truck is a commercial vehicle that serves as a traveling retail outlet for tasty frozen desserts usually during the summer or warm months of the year. Ice cream trucks can be found at public events, parks, beaches or busy neighborhoods where people hang out. Nowadays, most trucks have a freezer in the back were they keep novelty ice creams such a popsicles and bars. Some trucks serve hard ice cream. Others serve soft ice cream. The soft serve ice cream is from a machine and served in either a cone or a dish. Often they can be served with sprinkles on top for a small extra charge. Ice cream trucks are often independently owned. There are a few franchises out there but it is mainly a one-person show! 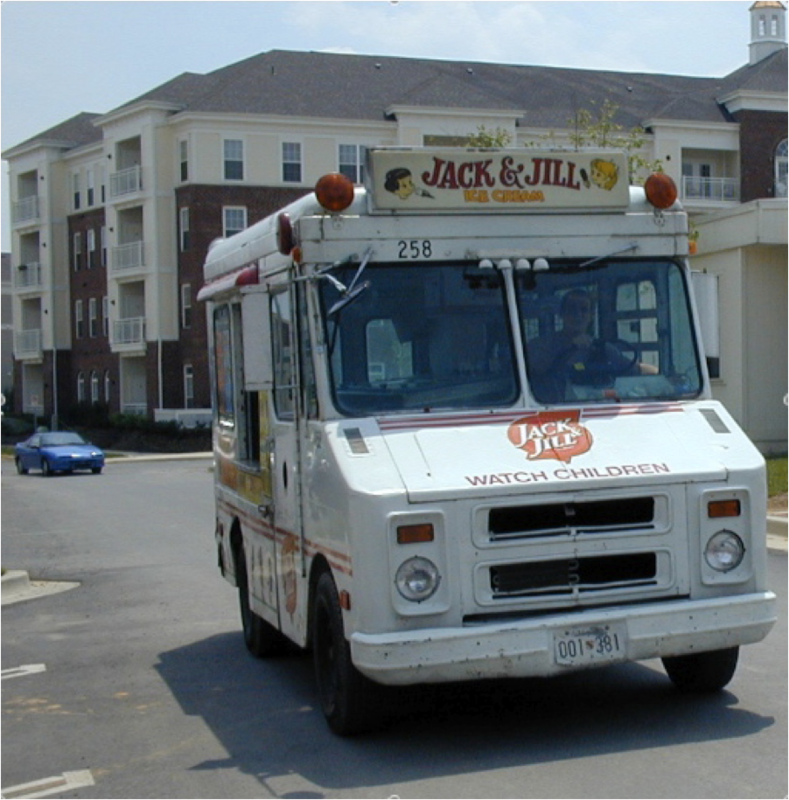 Ice cream trucks are often brightly colored with pictures or cartoon images. The truck often has a child's song playing over the loudspeaker. Songs frequently heard are: "The Mister Softee Jingle", "Turkey in the Straw", "Do Your Ears Hang Low?, "Pop Goes The Weasel" "The Entertainer", "Music Box Dancer", "Home on the Range", "It's a Small World", "Super Mario Bros. Theme" or "Camptown Races"
In Canada, "Dickie Dee" sold ice cream from tricycle carts. It ran from 1959 – 2002. In New Zealand and Australia, "Mr. Whippy" is very popular; an ice cream van franchise that started in 1964. Mr. Whippy now has vans the UK as well. In Norway, Sweden and Denmark, ice cream is delivered door to door by a light blue Hjem-IS Truck. It sells prepackaged, bulk ice cream by the box and the orders can be tracked on-line. A familiar tune is played during delivery. In Peru and other parts of South America, ice cream vendors sell on foot or by bicycle. They play trumpets on occasion to attract attention. In Thailand and Cambodia ice cream is often sold in sidecars of motorcycles.